I like that, walking fish. River in great shape today, should be perfect tomorrow. Very few fish taken today I was told. Conditions are A1, might have to go out and catch one. A very pleasant afternoon out there today great water conditions too, I missed a fish of some sorts on a cooked bug, it also grabbed the bug as I reeled in, did not see it though and would not give me another opportunity. 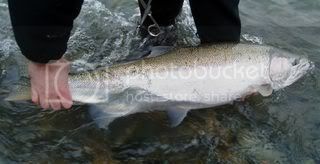 Only heard of one wild taken, up river but only talked to one other angler. Looks like some clay fell in today somer time as the water is now murky. The flow is silted right up! Murkey,murkey conditions! Just had a look at the crossing and it was deserted! Anglers must have headed up past the clay banks!Mother Nature throws out a stinker for New Years. the clay bank gave out at about um 9 am and it was just above borden. water was perfect before that saw two fish landed. one was my hatch and one wild both over ten pounds. was a great morning till the river coloured up. i got my hatch at about 7:30 to 8 am. i was with my dad so i had to stand around as my day ended only 8 casts in. to top it all off, the wind decided to make an appearance and make conditions more difficult. Just got back, visibility in the lower end is 6" tops... think tomorrow is a write off for sure!